Stop your OEM belt tensioner bracket from bending with Steeda's new Tensioner kit! A major problem with Supercharged applications as the increased belt length and tension puts unwanted stress on the factory tensioner. 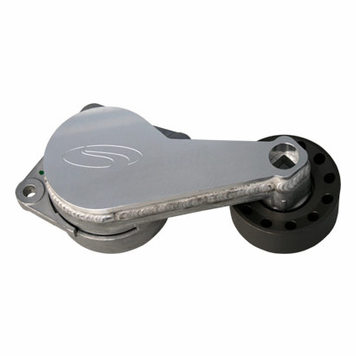 With the extra rotating mass of the supercharger and weight of all the accessories often the tensioner can flex. The end result can be a broken belt which can be hard to find and often expensive to service. This tensioner is a great fix for all blown Roush, Saleen and other bolt on supercharger applications. Kit is available with a factory pulley or an optional billet one as shown in the picture above.